Content marketing is about providing useful information in a compelling way, right? Well, humans have been doing that for centuries. What can we learn from some of the best content in human history? How can we apply this to B2B marketing today? The Bible is the world’s all-time best seller (with estimated sales of over 6 billion)  and is perhaps the most quoted content of all time. As useful content goes, it may be the most influential in the lives of more people than any other content in human history. Designed to provide a blueprint for human conduct and how to live a moral, ethical life (among other important purposes), it includes curated contributions from many authors over thousands of years. Has a lexicon that has inspired commonly used language in everyday life. The primary lesson we can learn from the Bible about content marketing is the power of storytelling. Everybody loves a good story, and humans have been telling stories for thousands of years. In fact, oral tradition was the primary means of passing down information from generation to generation until the invention of the printing press in 1439. Examples generate empathy in the reader, while aiding understanding. Consider incorporating storytelling into your content marketing. In the 6th Century AD, Sun Tzu’s The Art of War provided soldiers in the Chinese army with basic principles of military strategy using quotations about warfare in ancient China. Remarkably concise and practical in approach, the quotations are memorable and useful. For example, “Appear weak when you are strong, and strong when you are weak” and “The supreme art of war is to subdue the enemy without fighting” . The book provides best practices for identifying strengths and weaknesses in competitors, opportunities for advancing a position, and strategies for addressing specific situations. Fourteen centuries later, many interests and industries have co-opted the advice for planning, business tactics, political campaigning, sports, and more – wherever there is competition. The primary lesson of The Art of War is the power of practical, concise guidance in content marketing. When you develop and distribute content that provides truly useful, practical advice or best practices, your audience is more apt to share and repurpose it. When you release control of your content, the community adds value to your brand. Allow others to take your advice and run with it, expand it, and enhance it. Betty Friedan’s The Feminine Mystique addressed the frustrations of a specific demographic at a specific moment in U.S. history: college-educated, middle-class, suburban women. In this way, Friedan struck a nerve: she launched the modern women’s movement. Soon after publication in 1963, the book became a runaway best seller that’s widely regarded as one of the most influential nonfiction books of the 20th century. It served as a catalyst for social change. The Feminine Mystique reminds you to know and cater to your audience. Carefully define your audience. Learn about your audience through surveys, focus groups, or online research. What keeps them up at night? Be sure you understand the concerns of your audience right now – not what their concerns were a few years ago, what they might be in the future, or what you want them to be. Then highly tailor your content to specifically address your audience’s concerns and needs. If you can demonstrate your understanding of your audience’s needs and then respond to those needs, your audience is more likely to act on your call to action. Quotations from Chairman Mao Tse-tung, also known as Mao’s Little Red Book, served as an ideological field manual for soldiers in the Chinese Red Guard, or People’s Liberation Army. The book is a collection of quotations from Mao’s speeches over many years. Originally published in 1963, more than one billion copies were circulated during the Cultural Revolution. The goal and unofficial requirement was for 99% of the population of China to read it and carry it with them at all times; it soon became one of the most widely printed and distributed books in human history. Mao’s Little Red Book was actually used for the indoctrination and control of the Chinese populous. Despite this questionable practice, it remains a dramatic demonstration of readers’ affinity for quotations from authority figures. Relevant quotes from such sources make your content more compelling. Let the direct words of authoritative sources tell at least part of your story for you. Whether you want to change the world or simply enhance your position in your marketplace, it pays to follow some of the most proven content marketing practices from inspirational leaders of history: Target and understand your audience carefully, provide practical and concise content, and enhance your content with strong storytelling and authoritative quotes. What inspires your best content? We welcome your comments. Russell Ash, “The Top 10 of Everything 2002,” The Ten Bestselling Books of All Time. Goodreads, The Art of War Quotes. 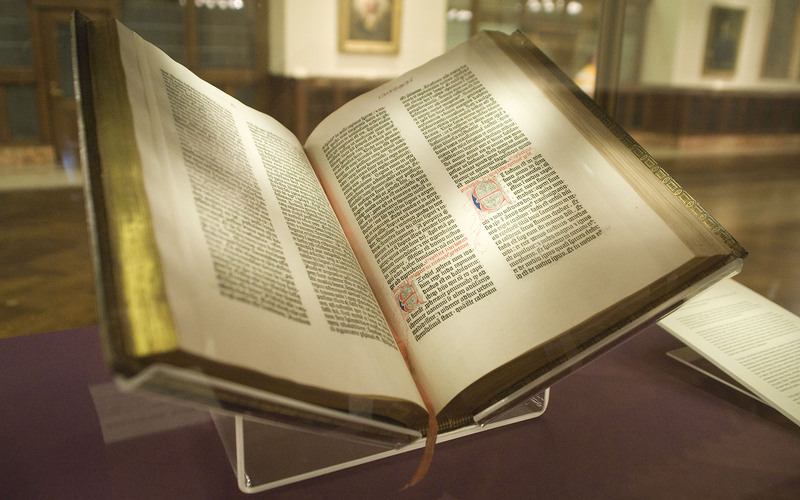 Photo credit: Gutenberg Bible, Lenox Copy, New York Public Library, 2009, licensed under the Creative Commons Attribution-Share Alike 2.0 Generic License.